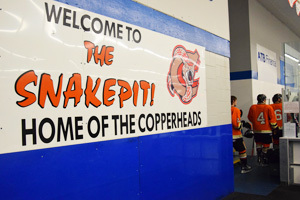 Coaldale Copperheads Junior Hockey Team officially this past weekend clinched first place seeding heading into playoffs in the south division. The Heritage Junior Hockey League extremely competitive again this season, seen the Snakes grasping first place for the second year in a row. In fact in a five year period, the Copperheads have reached this goal three times which is a credit to the whole organization. Similar to the 2014 season, the Copperheads heading to playoffs are sitting with points second overall in the Heritage League. Copperheads overall regular season stats were 29 Wins, 7 Losses and 2 Ties to collect their 60 points. Copperheads (1st) and Okotoks Bisons ( 2nd) will both receive a Bye the first round for the south. Immediately following this round, the timeline of the second round will go Tuesday, Feb 19 to Sunday, March 3. The first game will be played in Coaldale with date/times to be announced at short notice. Copperheads will have home advantage for the entire south division playoffs. They will be playing second round lowest seeded team winners after the outcome of Cochrane (3) vs. High River (6), and Strathmore (4) vs. Med Hat (5).